ANN ARBOR, Mich. — Fewer Americans may be feeling the blues, with rates of depression in people over 50 on the decline, according to a new University of Michigan Health System study. Between 1998 and 2008, rates of severe depression fell among the majority of older adults, especially the elderly, who have historically been a higher risk group for depression, new findings show. Meanwhile, late middle agers between ages 55-59 appeared to experience increased depression over the 10 year period. The nationally representative study appears in the Journal of General Internal Medicine. Over that decade, we saw a significant decrease in depression among older adults, and we need further studies to explore whether this is the result of improved treatment," says lead author Kara Zivin, Ph.D., assistant professor of psychiatry in the U-M Medical School and research investigator at the VA Center for Clinical Management Research. Even with signs of progress, however, a significant percent of our population is still experiencing severe symptoms of depression, and we need to do more to ensure all of these groups have proper access to treatment." Late-life depression has been a major area of concern among health providers, with studies showing increased depression at a time when many face death of loved ones, isolation, medical problems or changes in economic status. The new study, however, suggests improvements in this trend, with the most pronounced drop in depressive symptoms in people in the 80-84 age group. Increases in depression rates were concentrated among people in late middle age between ages 55-59 – a group that hasn't traditionally been focused on as an at-risk group. It's unclear whether this shift is an indication of a sicker population not being treated adequately, a burden on people of that age at that particular time or something else, which is why we need to do more research to better understand these patterns," Zivin says. Researchers used data from the Health and Retirement Study, a nationally-representative sample of older Americans that is conducted by the U-M Institute for Social Research on behalf of the National Institute of Aging. "We were pleased to see that there appears to be an overall improvement in depressive symptoms in the US, which is most likely related to better recognition and treatment. We are hopeful that our findings highlight the importance of depression diagnosis and treatment, and that we continue to make progress in developing better ways to systematically improve the outcomes of patients with depression," says senior author Sandeep Vijan, M.D., M.S., associate professor of internal medicine at the U-M Medical School and a research scientist at the Ann Arbor VA Health System. Additional authors: Paul A. Pirraglia, M.D. ; Ryan J. McCammon, A.B. ; Kenneth M. Langa, M.D., Ph.D.
Funding: National Institute on Aging (P01 AG031098 and U01 AG09740) and the Department of Veteran Affairs, Health Services and Development (CD2 07-206-1 and VA IIR 10-176-3). Reference: "Trends in Depressive Symptom Burden Among Older Adults in the United States from 1998 to 2008," Journal of General Internal Medicine, July, 2013, DOI:10.1007/s11606-013-2533-y. LONDON - The first-ever awards dedicated to sustainability in the beauty industry have been launched by Organic Monitor. The inaugural Sustainable Beauty Awards (www.sustainablebeautyawards.com) has opened for nominations, with winners to be announced at an evening reception in Paris on October 21st. The aim of the awards is to give recognition to cosmetic and ingredient firms who are pushing the boundaries of sustainability in the beauty industry. The awards have five categories that represent different sustainability aspects. The green formulations award is for cosmetic brands with a high level of green (natural / organic) ingredients in their formulations. The sustainable packaging award is for cosmetic packaging that has a low environmental footprint, whereas the sustainable ingredient award is for a material that makes a significant difference in terms of ecological and / or social impact. The sustainability pioneer award is for a company that is a leader in a certain area, whereas the sustainability leadership award is for an overall leader in sustainability. There is no charge for making nominations to the Sustainable Beauty Awards, however to be eligible cosmetic / ingredient / packaging firms / related firms must be making a difference in sustainability. The finalists for each category will be selected on 1st October, and the winner at a drinks reception at the Paris Marriott Champs-Elysées on 21st October. The awards reception will take place alongside the European edition of the Sustainable Cosmetics Summit (www.sustainablecosmeticssummit.com). Winners and finalists will benefit from media coverage and industry recognition of their sustainability achievements. The Sustainable Beauty Awards have been launched to reflect the growing importance of green issues in the cosmetics industry. Green has become the new black in the cosmetics industry, with cosmetic and ingredient firms undertaking various initiatives to make their businesses more sustainable. Amarjit Sahota, founder and director of Organic Monitor (event organiser), comments: "We have launched the awards to put the spotlight on cosmetic companies making a significant difference in terms of sustainability in the beauty industry, as well as to inspire other operators to take the green route." The event organiser plans to host the awards annually in Paris. The aim of the Sustainable Beauty Awards is to give recognition to cosmetic and ingredient firms who are pushing the boundaries of sustainability in the beauty industry. The inaugural awards reception will take place on 21st October at the Paris Marriott Champs-Elysées. Nominations for the five award categories are open until 20th September. Media passes are available for the awards drinks reception. More information is available fromwww.sustainablebeautyawards.com. The aim of the Sustainable Cosmetics Summit is to encourage sustainability in the beauty industry by bringing together key stake-holders and debate major sustainability issues in a high-level forum. The 5th European edition of this international series of summit will be hosted in Paris on 21-23 October. More information is available fromwww.sustainablecosmeticssummit.com/Europe. Organic Monitor is a London-based specialist research, consulting & training company that focuses on the global organic & related product industries. Since 2001, we have been providing a range of business services to operators in high-growth ethical & sustainable industries. Our services include market research publications, business & technical consulting, seminars and workshops, and sustainability summits. Visit us atwww.organicmonitor.com. Suits and Jocks are totally different breeds with nothing in common, right? Wrong. Professional athletes endure the same struggles as any other professional. They travel frequently and, aside from their job which involves both practice and game time, the pro athlete has to find time to work out, as well as make smart eating choices. "The players like Retrofit clients have a team of professionals (team nutritionist, Athletic Trainer and Strength Coach) who are there to help motivate them to make the right choices. They use these professionals to stay healthy and injury free so that they can perform in their profession just as Retrofit clients can use the professionals they have on hand to stay healthy and be on top of their game. And just like Retrofit clients, their experts don't travel with them. They are not going to be sitting next to them at the restaurant, so the athletes need to be able to apply the rules they've learned so they are making good food choices on the road to fuel the performance they need." Eat without distraction: When distracted, a person ends up missing out on the eating experience and is unsatisfied, which may trigger continued or more frequent eating. Eat breakfast: Eating breakfast reduces hunger, provides more energy, and facilitates healthier eating choices throughout the day. Increase intake of vegetables: Eat a ½ plate of vegetables at lunch & dinner. Decrease intake of coffee: Drink tea instead of coffee in the afternoon. Get 7-8 hours of sleep per night: Inadequate sleep directly affects diet and exercise choices. Drink 12 glasses of water (100 ounces per day): Drinking water is essential to overall health and has many benefits. For my part, I'm just glad to know I have something in common with professional athletes and as I chose my next meal out I'm fueling for performance with the help of my team. Jeff is an entrepreneur at heart with a lifelong passion for creating innovative and human-powered companies. He was Founder and CEO of three internet-based services companies. He served as SVP of Sales & Marketing for Ameritox, and VP of Marketing at Dyson. Jeff is an active member in Young Presidents' Organization (YPO). He holds a BS from The Wharton School at University of Pennsylvania and an MBA from The Kellogg Graduate School of Management at Northwestern University. "Why are so many Americans still being misdiagnosed when visiting the doctor?" The stats are pretty alarming – at least 15-28% of all medical cases are being misdiagnosed. Possibly a third of the $2.7 billion in wasted health care dollars can be tied to misdiagnosis and wrong treatments. Dr. David Harrison says many people are being misdiagnosed because of a fragmented health system. Doctors are time-strapped and just lack of knowledge about this issue, he adds. The needless suffering and wasted health care dollars continue to be a major problem, but it is a problem that can be solved. Harrison recommends patients be not accept a questionable diagnosis, but instead they follow five steps below to avoid being misdiagnosed. 1) Don't be shy. Be curious, and insistent. Ask your doctor questions about your diagnosis and treatment. Ask things like, "What else could this be?" Keep asking questions every step of the way until you're satisfied with the answers. 2) Get a second opinion. But don't show up and tell the next doctor, "I've been diagnosed with this type of illness, what do you think?" Instead, focus on telling the doctor all of your symptoms. Don't guide their thinking toward what the first doctor said you have. As Dr. Jerome Groopman writes in his classic book, "How Doctors Think," "Telling the story again may help the physician register some clue that was, in fact, said the first time but was overlooked or thought unimportant." 3) Take the time to get to know your family medical history – and make sure your doctor knows about it. Studies show your family history may tell you more about what kinds of illnesses you may have or are likely to get than even genetic testing. If you search for "My Family Health Portrait" on Google you'll find a handy online tool from the U.S. Surgeon General to assemble your own family medical history. 4) Take someone with you to doctor's visits. It's hard to listen to difficult medical news and pay attention to all the details at the same time. Bring along a friend or family member to remind you of questions you want to ask, and to help you write down important notes. 5) Have your pathology re-checked. If you had a biopsy and your diagnosis is based on your pathology report, try to get it reviewed again. Pathology is incorrectly interpreted more often than commonly thought. If that interpretation is wrong, your diagnosis – and your treatment – are probably going to be wrong, too. DURHAM, NC—The quality of nursing homes has improved in most states and in the District of Columbia since the 2008 implementation of the Five-Star Quality Rating System by the Centers for Medicare & Medicaid Services (CMS), an Abt Associates' analysis finds. The study shows that between 2009 and 2011, the percentage of nursing homes with an overall five-star rating, or much better than average quality, increased in all but three states and the proportion with a one-star rating, or much below average quality, dropped as well. There are more than 15,500 nursing homes in the country, and all of them are rated with between one and five stars. "Between 2009 and 2011, the percentage of nursing homes with a four- or five-star rating grew in every state except for Hawaii, Montana, and Idaho," said Alan White, Ph.D., a principal associate at Abt Associates who worked with CMS to develop the rating system. "While we don't know the extent to which the existence of the rating system itself has led to this improvement, most nursing home operators pay close attention to their ratings and seem to be motivated to improve them. Some use their ratings as part of their marketing efforts, branding their facilities as 'five-star' nursing homes." White said the Five-Star Quality Rating System was created to help consumers, their families, and caregivers more easily compare nursing homes when visiting CMS's Nursing Home Compare website. There they can learn about a facility's overall performance rating and how it performs in three separate domains—health inspection surveys, staffing, and quality measures. The ratings are updated monthly. While there has been an 8% increase in four-and five-star facilities in overall performance nationwide between 2009 and 2011, five states stand out as experiencing the greatest change in their proportion of nursing homes with a four- and five-star overall rating. These are Delaware, Tennessee, Georgia, Oregon and Indiana. The percentage of Delaware's five-star facilities jumped by nearly 23%; Tennessee's by about 16%; Georgia's by nearly 15%; and Oregon's and Indiana's each by about 14%. In addition to overall performance, the study provides state ratings in each of the performance domains. Health inspection ratings are drawn from standard and complaint surveys over three years, White said, explaining that nursing homes are inspected every 12 months on average to ensure they are following state and federal regulations. "The inspection surveys provide a comprehensive assessment of the nursing home, examining such areas as kitchen/food service, medication management, proper skin care, and the safety, functionality, cleanliness and comfort of the environment." White said. "If an inspection team finds that a nursing home doesn't meet a specific standard, it issues a deficiency citation, and the health inspection rating is based on the number and severity of deficiencies cited by surveyors." The staffing rating, said White, is based on the number of hours of care on average provided to each resident each day by nursing staff. "The ratings consider differences in how sick the nursing home residents are in each nursing home, since that makes a difference in how many staff members are needed." The quality measures rating is an assessment of nine different physical and clinical measures for nursing home residents that indicates how well nursing homes perform on important dimensions of care related to each resident's functioning and health status. While the Five-Star Quality Rating System can help consumers, their families and caregivers compare nursing homes more easily, White cautioned that it cannot address all of the considerations that go into deciding which nursing home is best for a particular individual. "The rating system is an excellent tool but it should be used in combination with other sources of information, including an onsite visit, in making nursing home placement decisions," he said. 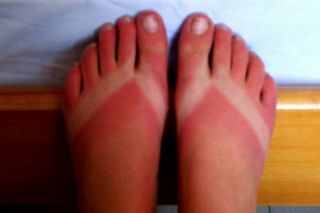 CHICAGO—July 8, 2013 Many people do not think about their feet when applying sunscreen, but did you know that the skin on your feet is highly susceptible to melanoma and other forms of skin cancer? The American College of Foot and Ankle Surgeons (ACFAS) warns that skin cancer of the foot is prevalent and can even be fatal if not caught early. Lather up with sunscreen from head to toe—literally—when at the pool or beach to protect your skin from the harmful rays of the sun. Check your feet and toes regularly for symptoms such as an abnormal-looking mole or freckle anywhere on the foot – even under toenails and on your soles. Look for moles or freckles that change in size or shape. If you notice anything suspicious, promptly schedule an appointment with your foot and ankle specialist to have the mark examined. Schedule routine exams with your foot and ankle specialist so he or she can keep track of suspicious, changing marks. According to Boston foot and ankle surgeon Thanh Dinh, DPM, FACFAS, early diagnosis is key to effective treatment for the condition. But because people aren't looking for the early warning signs or taking the same precautions they do for other areas of the body, often times skin cancer in this region is not diagnosed until later stages. The American College of Foot and Ankle Surgeons is a professional society of over 6,800 foot and ankle surgeons. Founded in 1942, the College's mission is to promote research, provide continuing education for the foot and ankle surgical specialty, and to educate the general public on foot health and conditions of the foot and ankle through its patient education website, FootHealthFacts.org.